The fifth batch of Iridium NEXT satellites built by Thales Alenia Space have been successfully launched by SpaceX from Vandenberg Air Force Base in California. Thales Alenia Space, the system prime contractor for the Iridium® NEXT program, is in charge of engineering, integration, and on orbit validation of all 81 Iridium NEXT satellites, in addition to the definition and validation of the overall system. 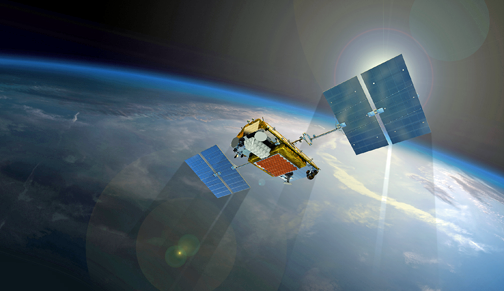 Artistic rendition of an Iridium NEXT satellite. The satellites are manufactured in production line process by Thales Alenia Space’s subcontractor Orbital ATK, at that firm’s Satellite Manufacturing Facility in Gilbert, Arizona, under the supervision of a dedicated local Thales Alenia Space team.Launch and Early Operations (LEOP) and In Orbit Tests are performed by Thales Alenia Space from Iridium’s Satellite Network Operation Center (SNOC) in Leesburg, Virginia. The Iridium NEXT constellation will offer global connectivity, thanks to 66 interconnected satellites at an altitude of 780 km., along with nine spares in parking orbits and six more spare satellites on the ground. According to the company, this global network provides unrivaled capabilities for communications on the move (individuals, land vehicles, aircraft and ships), and ensures fully global coverage, including the poles and over the ocean. Thanks to the global coverage and independent operation that does not require any ground infrastructure, Iridium NEXT provides vital a ssistance under very challenging conditions, such as in isolated areas, during natural disasters or during conflicts, to name a few.The independence from local ground infrastructures delivers secure communications, including protection against intrusion and hacking. Denis Allard, Constellations Vice President for Thales Alenia Space, noted that two-thirds of our satellites are now on orbit and performance is exceeding expectations. The next two sets of Iridium NEXT satellites are already available in anticipation of the 6th and 7th launches. Everything is on track to meet our objective, namely to launch all 75 Iridium NEXT LEO satellites in 2018.